The fastest SPI Host Adapter with support of Dual-SPI, Quad-SPI (SQI) and custom serial protocol. Use it to write and read on SPI, Quad-SPI (SQI) and many other serial protocols interfaces from PC. Supports many protocols up to 100 MHz and allows serial protocol customization. Features a 8-bit GPO / digital pattern generator. USB-powered. Delivered with Win32/64 GUI and free C/C++ API. Logic Analyzer, High-speed Digital Data Logger and I²C / SPI Analyzer. All-around USB device for digital system analysis. Can be used as a simple 20 bit logic analyzer with large 8 MS storage memory. Unique features include: data logger capability, with ‘always-on’/gigabyte-range data recording to PC. Includes hardware data qualification / data filtering capabilities usually reserved to high-end logic analyzers. Now includes fast SPI / I²C protocol decoding on up to 20 serial lines and display in waveform viewer. 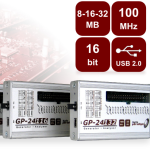 No-compromise PC-controlled digital pattern generator with up to 32 MB pattern memory, 16-bit wide patterns and 100 MHz operation. Generate digital inputs for your digital IC, ASIC, FPGA and digital board. Extract digital input vectors from simulation and apply them to a *real* device under test. Solution for early design testing, for missing parts emulation and corner case testing. Discover one of our most unique and successful products so far. 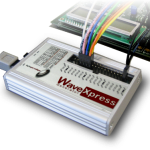 – Our digital pattern generator engine – identical to Wave Gen Xpress. 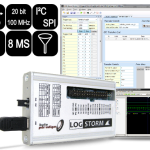 For advanced Logic, SPI and I²C Analyzers see: LOG Storm. 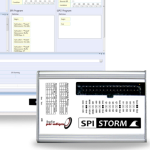 For advanced serial protocol host adapter, see : SPI Storm. Click here to find a replacement for discontinued products.